Budapest has an extensive and efficient transportation system. If you have some patience and minimal skills with reading maps, you can easily learn the system. The biggest disadvantage, however, is that metros and tram routes shut down for the night at around 11:30pm. Some areas of the city, most notably the Buda Hills, are beyond the reach of some night bus services. Taxis to the rescue. The transport organiser of the Municipality of Budapest is the Centre of Budapest Transport (BKK). When travelling, its passengers will come across metro trains, trams, trolleybuses, suburban railway trains, riverboats and buses, on which BKK tickets, travel cards and passes are valid (with the exception of the funicular, the chairlift and the boat services at weekends). During rush hours, all forms of transport are crowded, making it best to plan your travel around these times. Most importantly, crowded public transport is the place where you are most likely to be targeted by Budapest’s professional pickpockets. Transportation System/Links in Budapest - Click for a printable map! 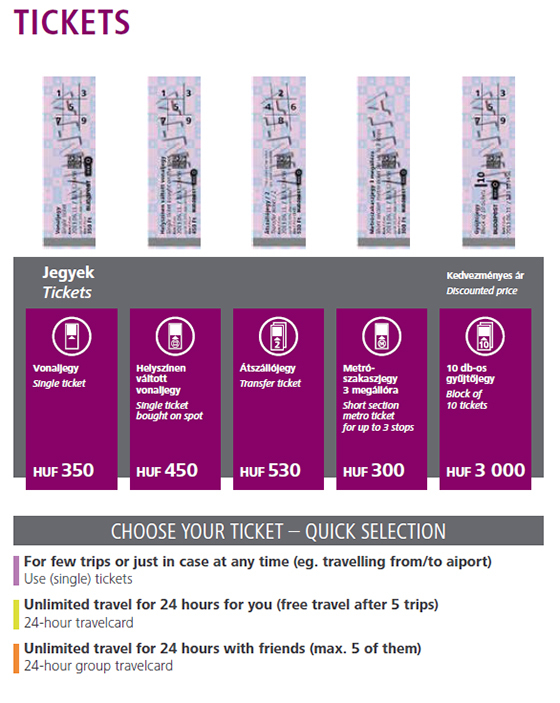 All forms of public transportation (metro, bus, tram, trolleybus, some HÉV railway lines, and cogwheel railway) in Budapest require the self-validation of prepurchased tickets (vonaljegy), which cost 350 Ft (EUR 1.11, or USD 1.34) apiece (children 5 and under travel free); single tickets can be bought at metro ticket windows and newspaper kiosks. Before boarding, please purchase your tickets, travelcards or passes at BKK ticket offices (Please click link to find the locations of BKK customer service centres, TVMs and ticket offices on the interactive maps) located at major transport hubs. Most ticket offices are open between 5:00 and 22:00. There are also automated machines in most metro stations and at major transportation hubs, but we still don’t trust them. We recommend buying a transport pass to avoid the trouble of constantly having to replenish your tickets. For 3.000 Ft (USD 11.5 / EUR 9.52) you can get a 10-pack (tízes csomag). Don’t miss your ideal ticket. The whole range of tickets and passes are available at BKK customer centres and ticket offices only. We strongly recommend that you buy a transport pass, which does not require validation. They are available for 1 day (napijegy) for 1,650 Ft and are good for 24 hours from the day and time marked. The other pass options are 3 days (turistajegy) for 4.150 Ft, 7 days for 4.950 Ft or for longer stays, 15 days (kéthétibérlet) for 6.300 Ft. The 7-day and 14-day passes need to be signed. If your plans are even longer, there is a 30-consecutive day pass (30 napos bérlet) at 9,500 Ft, which requires a photo. 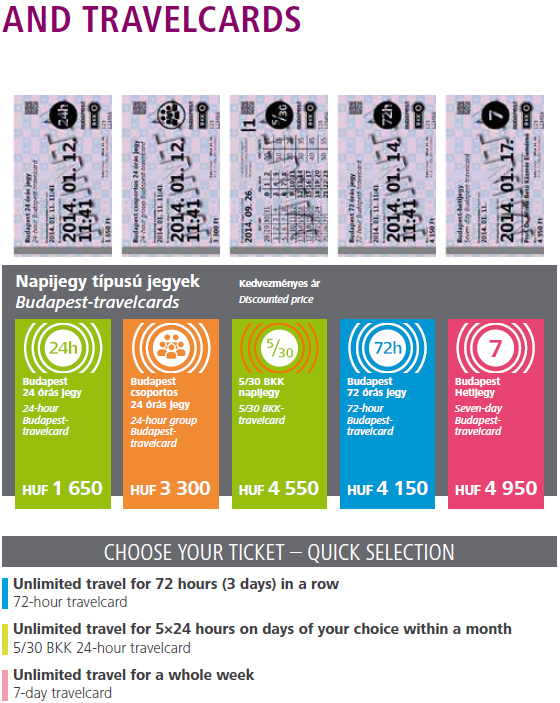 If you are going to Budapest for 4 to 5 days, the 7-day (hetijegy) pass is still a saving over individual tickets. Passes are so much more convenient than having a handful of tickets that you have to worry about remembering to validate each time or replenishing your stock at odd hours. Honestly, these will save you money in the long run. Buy your ticket in advance with your credit card. At most BKK sales points bank cards are accepted for payment. All new TVMs accept regular and also contactless bank cards. Passes. The 24-hour, 72-hour and 7-day travelcards as well as passes entitle passengers to an unlimited number of trips within the indicated period. Public transport boat tickets are valid only for single, one-way journeys. Please keep your ticket until the end of your trip as the inspectors may ask to check it any time. Some vehicles feature front-door boarding only. Please validate your ticket or show your pass to the driver when boarding. If you are not in possession of a valid ticket, travelcard or pass, the inspectors are entitled to issue an on-the-spot fine of HUF 8 000. The fine must be paid in cash in HUF only. On older-type vehicles the driver will open the door for you so you can get on. On vehicles with an opener next to the door, please push the button to get on. Some vehicles (buses, night buses and trolleybuses) feature frontdoor boarding only, which is indicated by a sign saying “Elsőajtós felszállás”. Please validate your ticket or show your pass to the driver when boarding. On most vehicles when you wish to get off, please push the stop request (leszállásjelző) button to indicate your request. The button is to be found next to the door. For getting off from buses and trolleybuses please use the rear doors. Passengers are allowed to cross the platform safety line only when the metro or suburban railway train has already stopped; please stand back from the platform edge until then. Please stand on the right on the escalators at metro stations, to give more space to passengers in a hurry. Please pay extra attention to your valuables at all times, especially when the vehicle is crowded. All public transport operates on rough schedules, posted at bus and tram shelters and in metro stations. The schedules are a little confusing at first, but the column on the left is weekdays, the middle is Saturdays, and the right is Sundays and holidays. Make note of the last ride of the night or you will be waiting for a bus that is not coming until the wee hours of the morning. 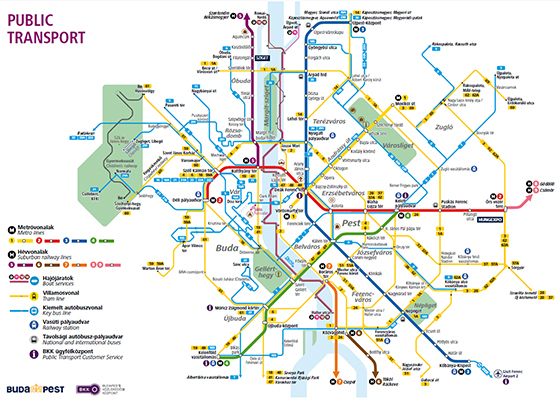 The transportation map produced by the Budapest Transport Authority (BKK térkép) is sometimes available at metro ticket windows for a small fee. On the map’s reverse side is a full listing of routes, including the all-important night-bus routes. There has been a shortage of these maps and it is uncertain whether they will continue printing them or not. Night services (buses plus tram 6 on the Grand Boulevard) run through the night until regular service resumes at dawn. Separate schedules for night and day buses are posted at the relevant stops. A major hub for night bus lines is Astoria. The solo night buses are front-door boarding only; onboard articulated vehicles ticket inspections are carried out at every door. Most of the Budapest transportation system closes down between 11:10pm or midnight and 4:30am. There are, however, 31 night routes, a dramatic increase over years past. They’re generally quite safe, though you may find a number of loud and inebriated youth or tourists traveling as well. For the most part, they are harmless. Night routes are posted at bus stops if that route has one. All night buses have a 9 as the first of a three-digit number. A few of them share the same numbers as buses on daytime routes or they may actually run different routes. Underpasses are the way you cross most major boulevards in Budapest. Underpasses are often little underground cities with vendors, shops, and bakeries, some with bars. The most confusing part for a traveler - as well as some long-time residents - is which exit to use. Many of them have as many as five or six different exits, each letting you out onto a different part of the square or street, which can be quite disorienting. Signs direct you, often using the word "felé", meaning “toward.” The signs will also include the street(s) at the top of the stairs. We suggest that before you enter the underground, you take note of the landmarks on the corner of your destination, framing the direction you will need to follow once downstairs. The World Heritage metro line M1 runs on the Pest side between Vörösmarty tér in the city centre and Mexikói út underneath Andrássy út, running to Hősök tere (Heroes’ Square). Metro line M2 connects Déli pályaudvar in Buda and Örs vezér tere in Pest through the city centre. Two major train stations (Déli pályaudvar and Keleti pályaudvar) are located along this metro line. Metro line M3 runs between Újpest-Központ and Kőbánya-Kispest stations on the Pest side of the city. Nyugati pályaudvar train station as well as Kőbánya-Kispest station, where Airport Bus 200E arrives, are located along this line. Metro line M4 connects Kelenföld Railway Station in Buda and Keleti Railway Station in Pest using modern, driverless trains. The metro system is clean and efficient, with trains running every 3 to 5 minutes on weekdays and 6 to 8 minutes on weekends, from about 4:30am until about 11:10pm. There are four lines, with only the Red and the newest, No. 4 line going under the Danube to Buda. The three "old" lines are universally known by colors, but numbers are also used: Yellow (No. 1), Red (No. 2), and Blue (No. 3). You will see both the color and number on maps, and all signs are color-coded. The old three lines converge at Deák tér, the only point where any of the lines meet. The Yellow (No. 1) line is the oldest metro on the European continent and second oldest in the world, having been built in 1894 as part of the Hungarian millennial celebration. Refurbished and restored to its original splendor, it is the most attractive and shortest metro line in the city. Yellow metro signs are different from those for the Red and Blue lines. They lack the M to signify metro. Instead, the aboveground stations have large yellow signs above the stairwells with the word földalatti (underground). Most of the stations entryways are painted yellow as a visual clue. Each station has two separate entrances, one for each direction. Confusingly, some of the stairwell entrances are in the opposite direction from the direction the train will be going. The Red (No. 2) Blue (No. 3) and the newst, No. 4 lines are modern metros, though the outside of the cars tend to look old and decrepit (except the new Metro line of course). To reach them you descend long, steep escalators; the Red line has the longest and steepest. If you are prone to vertigo, you may want to take care. The Red line runs from Örs vezér tere in eastern Pest, through the center, and under the Danube, finally ending at Déli Station. Nyugati Station is along the Blue line. Metro stations. At the entrance of metro stations, the validator machines stamp the starting time of your trip onto your ticket. On the street, distinctive colored "M" signs of both the Red and Blue lines point out the stations. Validate tickets at automated boxes before you descend the escalator. When changing lines at Deák tér, you’re required to validate another ticket (unless you have a special “metro transfer ticket”). The orange or red validating machines are in the hallways between lines, but are easy to miss, particularly if there are big crowds. The extensive Budapest bus network of almost 200 lines provides access to the city centre from almost anywhere within and outside of the city with an average frequency of 10–15 minutes. More than half of the fleet are low-floor vehicles. On some services a front-door boarding only policy is in place. The old buses are dark blue, while the new ones have sky-blue livery (same fares apply for both). Many parts of the city, most notably the Buda Hills, are best accessed by bus. Although buses are the most difficult to use of Budapest’s transportation choices, with patience (and a BKK map) you’ll be able to get around. With the exception of night buses, most lines are in service from about 4:30am to about 11:30pm. Some bus lines run far less frequently (or not at all) on weekends, while others run far more frequently (or only) on weekends. This information is posted at every bus stop. Black-numbered local buses constitute most of the city’s lines. Buses with red numbers are express buses that skip minor stops. Check the list at the stop to see if your destination is one of the stops. If the red number on the bus is followed by an E (there are only five routes with an E), the bus makes very few stops between terminals and is best avoided. Look for the sign on the front of the bus to see if it is a regular or express. Tickets are self-validated onboard the bus by red boxes found by the doors. You can board the bus by any door, but manners dictate that you stand to the side of the door to allow disembarking passengers out before you start to board. Each time you change buses, you need a new ticket and have to validate it. Again, this is not necessary with a transport pass. Tickets cannot be purchased from the driver; see “Fares” above for more information. The dense tramline network features picturesque routes. One of the most beautiful tramlines of the world, tram 2 runs along the river Danube in Pest on the Pest side between Margit híd and Boráros tér, provides an incredible view of the Buda Hills, including the Castle District. It is better than a tour bus. We especially recommend this route at night. The world’s longest open-gangway, walk-through trams serve lines 4 and 6, on the busiest tram routes in Budapest travelling along Nagykörút, the Grand boulevard, connecting Pest and Buda encircling the city centre. Tram 4 runs between Széll Kálmán tér and Újbuda-Központ, while tram 6 runs 0–24h between Széll Kálmán tér and Móricz Zsigmond körtér. Trams 1 and 3 are also among the most important lines with ring-shaped routes surrounding the city. You’ll find Budapest’s 32 bright-yellow tram lines (known as villamos in Hungarian) very useful. Tickets are self-validated onboard. As with buses, tickets are valid for one ride, not for the line itself. Important: The red buttons near the tram doors are for emergency stops, not stop requests. When a tramline is closed for maintenance, replacement buses are assigned the tram route. They go by the same number as the tram, with a "V" (for villamos) preceding the number. See “Fares” above for information on tickets. The environmentally-friendly, quiet and electrically powered (receive power from a cable above the street) red trolleybuses have a dense network in the inner city on the flat Pest side of the city. One line that can be of use to visitors is the 70 which originates near Kossuth Lajos tér by the Parliament and cuts through the city centre via Nagymező utca (Budapest’s "Broadway") before crossing Andrássy út and running on Király utca on its way to the Városliget (City Park). There are only 16 trolleybus lines in Budapest, all in Pest. Of particular interest to train travelers is No. 73, the fastest route between Keleti Station and within a block of Nyugati Station. All the information in the “By Bus” section above applies to trolleybuses as well. See “Fares” above for information on tickets. Hév (suburban railway lines) serve the outer areas of Budapest. If you are going to destinations nearby Budapest, for example to Szentendre (H5) or to Gödöllő (H8), please remember to get extension tickets needed for the route sections outside of the city boundaries which are not covered by your tickets, travelcards or passes. Line H7 is an exception as it operates only within Budapest. Suburban railway passes are also available; they are for sale along with tickets at BKK ticket offices and from new purple-coloured Ticket Vending Machines. Tickets are also sold by conductors onboard suburban trains. Leaving the city boundaries by suburban railway (HÉV), passengers have to purchase an extension ticket at the ticket office or from the conductor on board if the ticket office is closed. However there are four HÉV lines; only the Szentendre (H5) line is of importance here. Most hotels, restaurants, and sights in northern Buda and Óbuda are best reached by the HÉV (so indicated in the directions given). To reach Óbuda’s Fő tér (Main Sq. ), get off at the Árpád híd (Árpád Bridge) stop. For trips within the city limits, the cost is one transit ticket, self-validated as described above, or use a pass. The HÉV suburban railroad connects Budapest’s Batthyány tér with Szentendre. On the Pest side, you can catch the HÉV from the Margit Híd, Budai Híd Fő. Trains leave daily, year-round, every 20 minutes or so from 4am to 11:30pm (trip time: 45 min.). The one-way fare is 560 Ft subtract 230 Ft if you have a valid Budapest public transportation pass. The trip takes 45 minutes. This HÉV route runs regularly between 4am and 11:30pm. Budapest’s cogwheel railway (fogaskerekű) began running in 1874, becoming electrified in later years. It runs from Városmajor, across the street from the Hotel Budapest on Szilágyi Erzsébet fasor in Buda, to Széchenyi-hegy, one terminus of the Children’s Railway (Gyermek Vasút) in 20 minutes.The cogwheel railway runs from 5am to 11pm, and normal transportation tickets (see “Fares,” above; self-validated onboard) are used. The cable car or funicular (sikló) connects Buda’s Clark Ádám tér, at the head of the Széchenyi Chain Bridge, with Dísz tér, just outside the Buda Castle. The funicular is one of only two forms of public transportation serving the Castle District (bus Nos. 10 and 16 are the other possibilities; see “By Bus,” above). The funicular offers an extremely steep and short ride, but an excellent view. It runs at frequent intervals from 7:30am to 10pm daily (closed on the second Mon of the month). Tickets cost 700 Ft ($3.80/L2.35) to go up and 1,300 Ft ($7.30/L4.50) for a round-trip for adults, while children get a break at 400 Ft ($2.15/L1.35) up and 750 Ft ($4.05/L2.50) round-trip. On the section of the river Danube within Budapest, public transport boats serve several piers located near transport hubs on both the Buda and Pest banks. Line D11 terminates in Újpest, while D12 and weekend-only service D13 operate to Rómaifürdő. On workdays Budapest-passes are also valid for boat services, but at weekends only the dedicated tickets for public transport boats are accepted for travel. Budapest taxis fall into two general categories: legitimate and not. All legal, licenced taxis must have yellow car colour. The fare to be paid at the destination consists of three basic parts: the base fee; the kilometer distance fare; and the waiting tariff, which is used if the taxi has had to stop or has to travel slower than 15 km/h (9 mph) in traffic. Please note: From 1 September 2013 a new Taxi Decree was introduced in Budapest and regulating the price of the taxis at a fixed tariff of 280 HUF/Km (0.95 EUR/Km) in addition to the one-off basic fee of 450 HUF (1.50 EUR) and waiting fee. A ride to the city center from the Airport should typically cost around 6500 HUF (22 EUR) depending on traffic conditions. We particularly recommend Tele5 (00 36 1 355-5555). Other reliable fleets include City Taxi (00 36 1 211-1111), Volántaxi (00 36 1 466-6666), Rádió Taxi (00 36 1 377-7777), and Főtaxi (00 36 1 222-2222). Call one of these companies from your hotel, ask a restaurant person, or ask whoever is in charge to call for you, even if there are other private taxis waiting around outside. Dishonest drivers will ask you to pay for the return trip, ask to be paid in anything but forints, or quote you a “flat rate” in lieu of running the meter. The chances are slim that you will encounter this with any of the companies above. If you need extra room, request a station wagon by asking for a "kombi", and in the summer you can also request an air-conditioned vehicle. Tipping is usually not more than 10%. Hungarians usually round the bill up. If you think the driver has cheated you, then you should call the company and complain, as most will punish their members for untoward behavior. We believe anyone wanting to drive in Budapest has a death wish. Not only are there crazy drivers, but you also will find a serious lack of stop signs or traffic lights on most streets. However, you may wish to rent a car for trips out of the city. Hertz, Avis, Alamo, National, and Budget have offices in the city and at the airport, but marginally better deals may be found by making arrangements directly and in advance on their websites. You are urged to reserve a rental car as early as possible. If you reserve from abroad, ask for written confirmation by fax or e-mail. If you don’t receive a confirmation, it’s wise to assume that the reservation has not been properly made. The driver must be 21 years old with no upper age limit and is the only authorized driver; the driver’s license must be at least 1 year old; an International driver’s license is required.